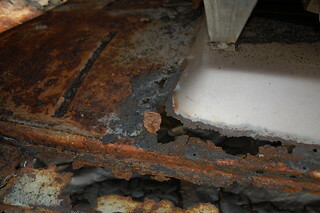 I finally decided to get back to doing some rust work on the truck. 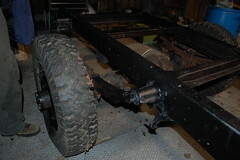 I haven’t yet figured out how to fabricate the inner rocker, so I decided to work on the rot in the fenders first. I cut the bottom of the fender off, only to discover the inner bracket was rotted out and a prior owner had done some hack repair work. 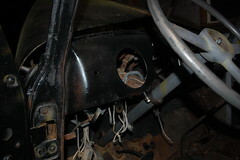 All the original bracketry for attaching the fender was cut out and not replaced properly The fender was actually welded to the cab. Now I have an entirely new problem to deal with. 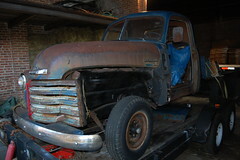 I have to decide whether to buy all the patch panels to fix the cab mounts & fender bracket which would cost about $250. The other option is to fab it all from scratch, or only buy part and fab the rest. I’m going to have to do more thinking on this. 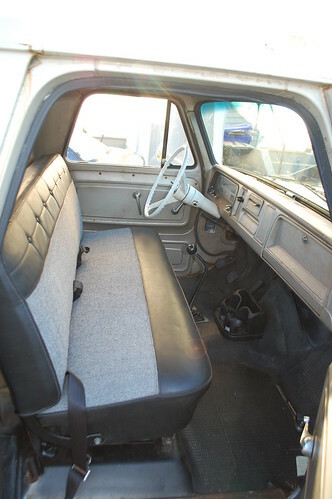 The seat in the ’64 Chevy was a disaster area, and made the cab look like it had been a home to wolverines with a 2-pack a day habit. 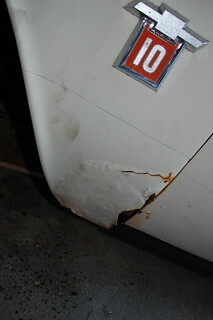 It was torn, paint splattered, and yellowed with nicotine stains. 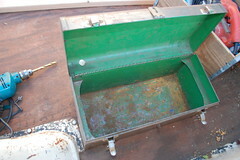 And it was covered with a cheap ill-fitting cover that came off every time you climbed in. 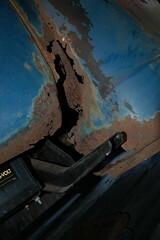 A factory-correct replacement seat cover was $150 + shipping and that wouldn’t fix the battered foam. A local upholstery shop gave me a quote of $250 to completely re-upholster it, but that would be in plain vinyl that would be pretty boring looking. 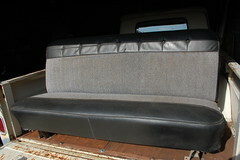 I was surfing the list that is Craig’s one day when I found this bench seat for sale for all of $100. 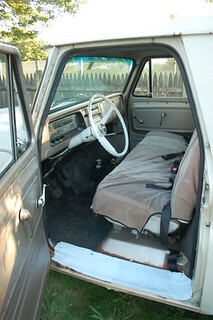 It is from a similar truck but had been custom upholstered. 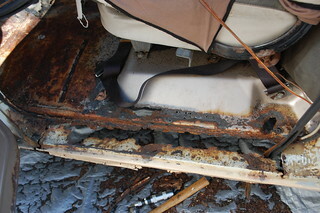 The seller was replacing it with some bucket seats. It was in perfect condition aside from one minor tear in the piping. I power-washed the whole thing to get the grime out of all the nooks & crannies. It turns out the tweed portions were once blue, but had faded to the current grey(which I’m ok with, as I prefer the grey). I also painted the brackets on the sides while it was apart. After installing the seat I was amazed at how much it changed the interior. With no other changes but the seat the cab now looks respectable with a bit of patina. One thing the truck is sorely lacking is storage space. Putting stuff under the seat is a recipe for being smacked in the ankles under emergency braking. 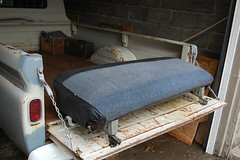 I had an old crate in the bed to hold various ratchet straps, bungee cords, tarps, etc. The problem was it would slide around when driving, and everything got soaking wet in the rain. 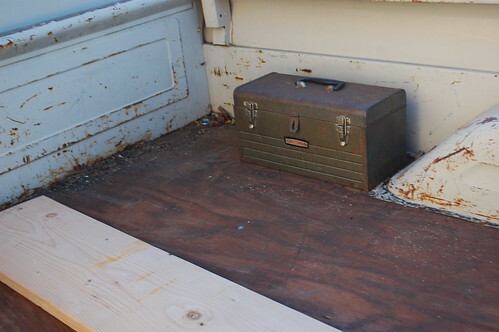 I bought this tool box at the flea market for all of $5, I liked its design, and the somewhat battered look suits the look of the truck quite well. I knew it would stop the getting wet problem, but I needed it to both not slide around, and to make it a little harder for someone to steal it. I bought two wing screws(like wingnuts, but screws, I didn’t know this existed before I found them) and some nut inserts for wood. 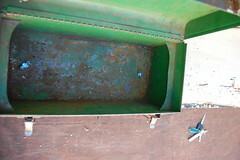 Then I figured out where I wanted the tool box to be(making sure to position it so the lid could open), and drilled two holes through the bottom of the and through the wood of the truck bed. From below I hammered in the nut inserts, I went from below so they wouldn’t just get yanked out if someone tried to pull the tool box up. Turns out I didn’t get the holes completely straight which made getting the inserts to stay properly was a pain. 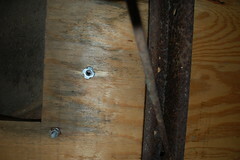 Finally the wing screws were installed. Now the tool box won’t be sliding around, but if I need to remove it, it should only take a moment to remove the wing screws and lift the whole thing out. 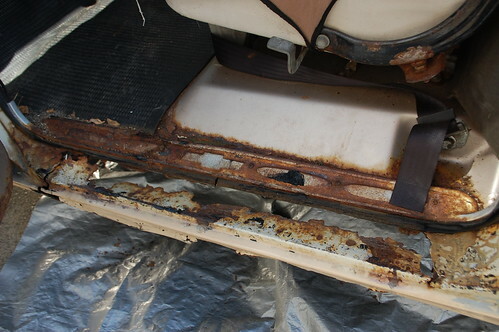 When I bought the ’64 Chevy I knew the worst rot on the truck was in the driver’s rocker area, the whole area was rotted badly enough you couldn’t step there without the whole thing crunching and feeling like it would collapse at any second. Part of my plan with this truck is to fabricate metal repairs wherever possible, so I could practice metal fabrication, and save money. With the rocker I decided to buy a replacement outer rocker, but fabricate the inner stuff myself. 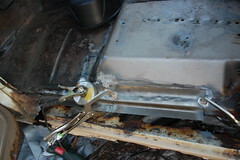 I started by pulling off the sill plate(which was a ruin in and of itself), and made a pass with my Harbor Freight sandblaster to find all the rust holes. I was left with very little good metal. 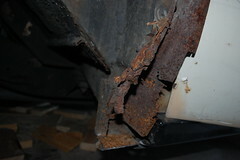 It quickly became clear that the decorative sill plate had become structural, and was stronger than the remaining rocker. 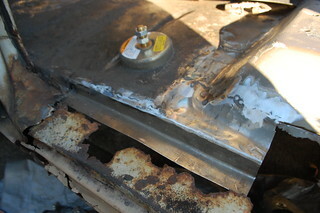 So first I cut back to solid metal, getting rid of all the marginal stuff so I knew I had a solid base to start from. Then came the first of four patches. I formed the right angle bends with the help of a brake, but the rest was hammer formed using whatever around the garage had the shape I needed. 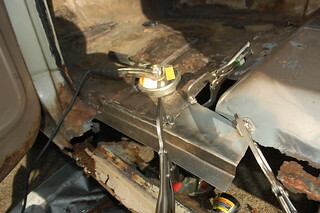 Then it(and the second filler patch) was welded in and ground smooth. Then the second patch, before and after. And the third. This patch only got tack welded in before I ran out of light. 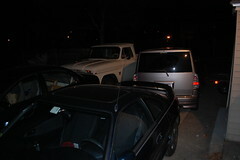 Then between Hurricane Sandy & selling the wagon I haven’t gotten back to it. But the floor is already noticeably more solid with just this much completed. 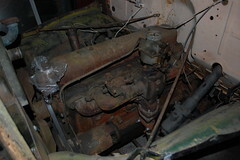 I looked at this 1953 GMC the same day I looked at the half-dissolved ’53 Chevy pickup. After how that truck was falling apart but supposedly solid drivetrain-wise I thought if I could find another truck that was more intact I could combine them into one good truck. 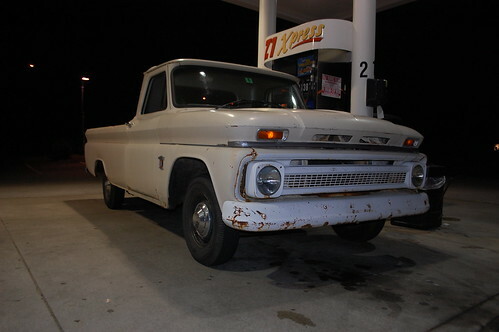 The seller of this truck was asking $1250, but it was pretty clear even over the phone that he was more desperate to get rid of the truck than to get the most for it. 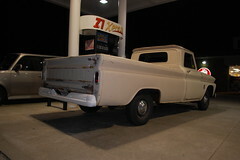 So once again I piled into Box and headed out to look at a truck. 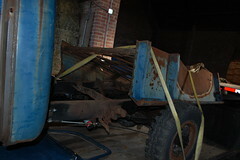 Upon arrival I was led out to a dirt-floor garage where there was about 60% of a truck. 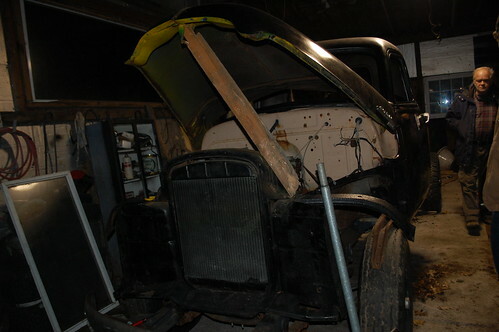 The frame & drivetrain were complete and it had a cab with a hood & both doors. That was about it. 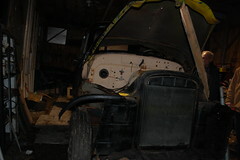 There was no bed, no seat, no fenders, no grille, no bumpers, most trim was gone. 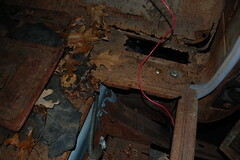 The gauges were in a disassembled pile in a half-rotted box. 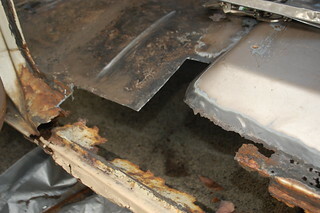 Worse, the parts that were there were in rough shape. 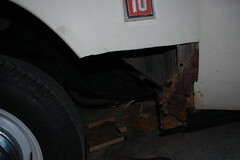 While not anywhere near the scale of the other truck, the cab had its fair share of rust, and everything had been badly spray-painted black. I made my polite goodbyes and fled back towards home. About ten minutes after I left the guy called me and mentioned he had an LMC truck catalog that had all the things the truck would need in it. I explained to him my worry wasn’t finding all the missing parts, it was affording them. I can’t even imagine how complicated it would be to figure out every single piece that was missing, track it down new or used & put it together never having seen it complete. Fortunately I was smart enough not to buy the truck, so I don’t have to do that. 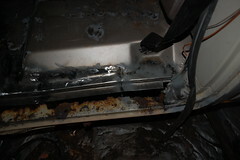 I found myself joking shortly afterwards tha that after a truck that was mostly rotted and another that was mostly missing, would the next one be on fire when I got there? 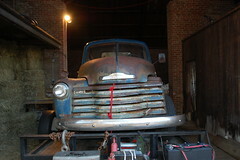 Unlike the ’59 Pontiac, the seller of this Chevy truck was at least up front that it was really rusty. He’d advertised it for $1900 and said it ran well and had all new brakes, but needed the rust fixed and needed to be re-assembled. The truck was supposed to me a 1953, but the cab details didn’t match, the doors without vent windows imply it is a 1950 at the latest. Upon arrival I found the truck, or more accurately the pieces of the truck, still loaded on his trailer from picking it up. 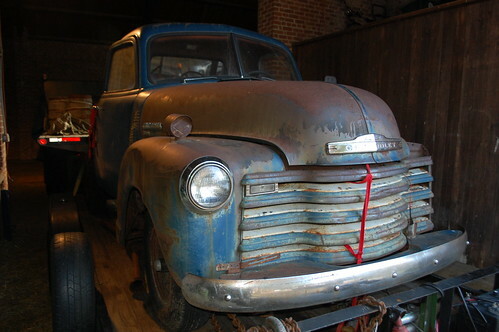 He’d apparently traded an International pickup for it to someone who wanted a drivable truck. 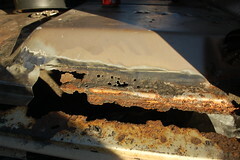 These “Advanced Design” trucks are very popular, and go for good money, so I wasn’t surprised to find that a $1900 truck was in this kind of condition. 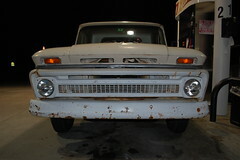 However this truck was way beyond both what I was interested in working on, and what I had the skills & time for. 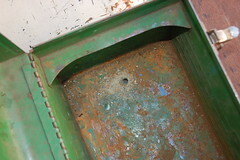 Someone had started replacing the floors & rockers, however they were welded to more badly dissolved metal. 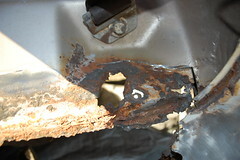 I could tell very quickly that any metal repairs to the truck were going to be a struggle to find metal solid enough to weld or bolt to. Even given all of that, I couldn’t help but like the truck. If it was a bit more intact and a bit less rotted I would have been quite happy to pick it up and bomb around in it in its trashed state for a while. However I was at least smart enough this time to stare down the barrel of massive amounts of work to simply get it on the road, and turn away.